If I am beating this topic into the ground, so be it. Sometimes, you just need to beat a dead horse, regardless. 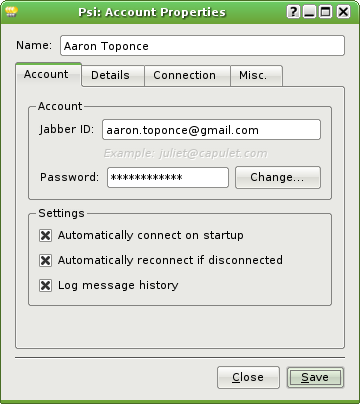 Due to the decision of switching to Jabber exclusively, I am on the lookout for a good Jabber client for Linux. In fact, a cross-platform client for Windows and Mac OS X would be nice too, but not necessary. Gaim is good, as it takes advantage of the Jabber IM protocol, but it lacks in many features that even less mature clients have already implemented. I needed something more and I stumbled across Psi. 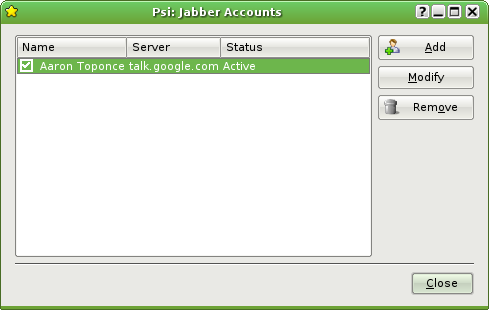 Psi (pronounced "sigh"), is a cross-platform Jabber client written using the Qt libraries from Trolltech. Upon initial discovery, Psi is very KDE-ish, if you will. The icons, and implementation of the Qt libraries make it fit well with KDE. Looking further into the client, shows a very mature level of development, even for a 0.10 release. The first feature I was eagerly looking for, that is not implemented in Gaim, was sending a single message to multiple contacts. I get a lot of crap for this feature, as people ask why. Plain an simple. As president of my local LUG, I would like to send a message to the LUG reminding them about a meeting or activity. Maybe I would like to send a message to all my family about some certain reminder. At any event, it is very useful. Luckily, Psi has this feature implemented. Next, I wanted a client with encryption security. Now many clients implement this with a plugin. Gaim is one such client that requires a plugin if you would like your messages to be sent encrypted. The problem with Gaim and the advantage with Psi is PGP keys. Gaim uses a builtin encryption layer which works, but how do I know the strength of the keys between myself and the person I am communicating with? How do I know that there isn't a backdoor or other such security issue with the plugin? Sure, it's OSS, so just pull the code up and check myself, but I want to know without digging through code that my conversations are in fact safe. With using individual PGP or GnuPG keys that each user has, as well as my own personal GnuPG key, I can rest assured that my conversation is safe, with no worries of breaking the encryption or security issues. The only drawback to this, is if the user you would like to communicate does not have a PGP or GnuPG key, you can't engage in that secure communication. Also, it only works with other Psi users or clients that use the PGP or GnuPG keys rather than plugins. In other words, I can't have an encrypted conversation with you if you use Gaim and I use Psi. At least not that I am aware of at the moment. Lastly, this client is lightweight, and fast. It takes literally no time to launch the application, and everything just seems very snappy. Again, this is very impressive for a 0.10 release. I honestly can't wait to see what 1.0 brings to the table. Ok, everything is great and all, and I've hopefully convinced you to at least try it out. So how do I use my Gmail account with Psi? Good question. It is actually quite easy. The Psi wiki actually has a post with screenshots and setting it up along with troubleshooting questions. The only question you may have is why a plaintext login would be required to login. Well, the same reason a plaintext login is required when you pull up the Gmail web interface- so Gmail can authenticate you. Don't worry, though, your password is send along the SSL encryption layer, so people sniffing the network packets won't be able to read it. I know, I tried. In a nutshell, here is how to setup your Gmail account with Psi including screenshots. Lastly, we just need to setup our connection to the Gmail servers. No proxy is needed unless you connect to them by default. We want every checkbox here checked. In other words, we do want to use SSL encryption when sending the login info, we want to supress all SSL warnings, use a plaintext login, keep our connection alive and specify what server we would like to connect to. 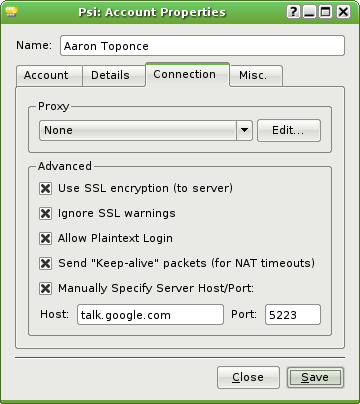 The server is "talk.google.com" port 5223 or 5222. Save and exit. Connect, and begin to enjoy using Psi. Posted by Aaron Toponce on Saturday, April 15, 2006, at 8:53 am. Filed under Gaim, Jabber, Linux, OSS, Security. Follow any responses to this post with its comments RSS feed. You can post a comment or trackback from your blog. For IM, Email or Microblogs, here is the Shortlink. I love the idea of being able to use PGP directly from within an IM client, but I'm not willing to move from a multi-protocol client like Gaim to any single-protocol client. Is there a good multi-protocol client that supports PGP keys? I don't know of another client at all that uses PGP and GnuPG keys, such as Psi does. For me, it is all about the transistion to Jabber exclusively, so using a multi-protocol client isn't a priority. However, if I come across such a client, I'll definitely post it! Make sure you give gajim a try, too. I know exactly what you're going through. I used to use gaim exclusively before I discovered jabber. I've been going through every jabber client I can find and giving them each at least a week of testing. I found psi and used it for a long while before forcing myself to keep trying new clients. I'm not sure if you use KDE or Gnome (I use neither), but gajim is written in python for GTK+. Its features are comparable to psi, but it has a few extras that push it over the top (if you can stand the fact that it's written in an interpreted language).